Since May, when David Zwirner suggested at a conference in Berlin that larger galleries should subsidise smaller ones at fairs, there has been much debate over stand prices, particularly in relation to the plight of small and mid-sized galleries. In the space of two days last month, Art Basel and Frieze announced they would be introducing new sliding-scale price models for booths, starting at Art Basel’s original fair in Switzerland and at the new Frieze Los Angeles. The aim of both is that galleries taking larger stands should pay more per square metre than those taking smaller ones; what is new is that this applies within the main gallery sections and not curated sections, as has previously been the case. In September, the Paris fair Fiac also announced it is introducing a similar tiered scheme for the 2018 event this month. 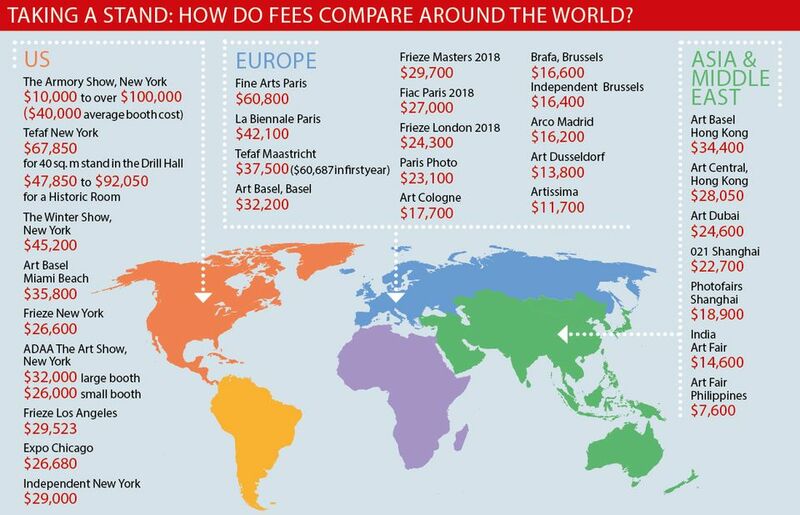 To find out how fair fees compare, The Art Newspaper undertook a survey of more than 40 events worldwide, which revealed complex organisational and cost structures. No two events are quite alike; some, like New York’s Winter Show, are non-profit, others are government-backed. What was most striking was the disparity in attitudes towards imparting information; although Tefaf, despite being among the most expensive, has documents outlining all costs freely available on its website, others would not disclose figures, among them Masterpiece London, Fine Art Asia, Art Brussels, PAD, FOG Design+Art, West Bund Art & Design, Art Stage (Singapore and Jakarta), Art Taipei, Artgenève and Artmonte-carlo. Anecdotal evidence from galleries revealed that a 33 sq m stand at Masterpiece London cost £36,828 (around $48,400) this year not including extra fees, suggesting a 40 sq m stand would cost roughly £44,640 ($58,600). At West Bund Art & Design in Shanghai, a 70 sq m stand cost Rmb280,000 ($40,700), again suggesting a 40 sq m stand would be around Rmb160,000 ($23,260)—roughly on a par with the 021 Shanghai fair which runs concurrently in November. Given the fact that some of those who declined to disclose figures are reputedly among the most expensive, and taking into account widely varying fee structures, calculating a list of those with the highest stand costs would be misleading. The figures stated here, calculated for 40 sq. m stands in the main sections of fairs, allow rough comparison but do not reflect sliding scales at the fairs, where they exist. The figures shown here—though they include varying levels of stand fitting and should be taken only as a guide—illustrate how significantly costs vary around the world. While the map below concentrates on more expensive fairs, among the more affordable events contacted was Independent Brussels, where a 25 sq. m stand in the young galleries section costs around €4,000 (around $4,700). *All calculations and dollar conversions are intended as a rough guide only and reflect the information provided by fairs at the time of going to press. Prices quoted, unless otherwise stated, represent the estimated cost for a 40 sq. m stand in the main section of a fair (not cheaper curated sections) based on the figures provided, including extra fees where applicable (all figures are approximate and include varying levels of stand fitting and lighting). Extra taxes and fees may apply. 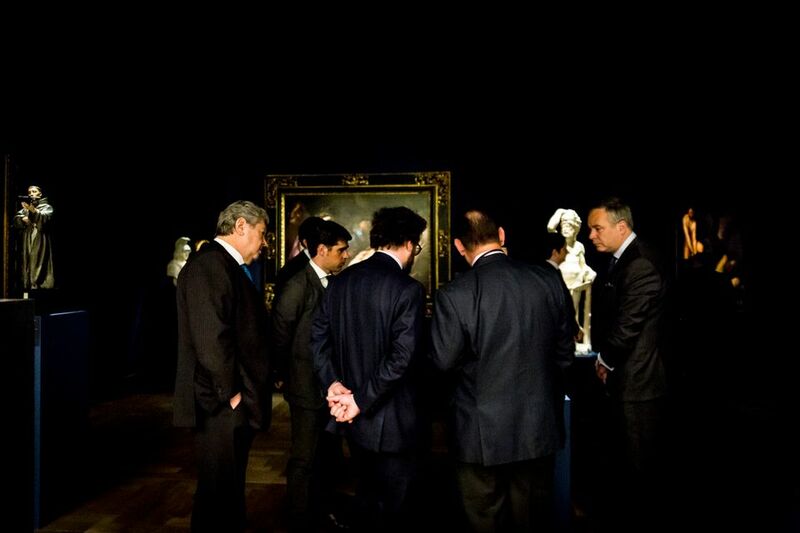 Price quoted for Fine Art Paris is all-inclusive.